Miami, FL — Janet Martinez was at home Wednesday afternoon when several neighborhood children who were playing in the front yard with her son came running in to tell her her son had been run over. “The kids came running to my house and told me my son just got run over by a police officer,” explained Janet Martinez. According to the neighbors, the officer was speeding down the street with no lights on when he struck 6-year-old Antoine. “He was speeding you know, in a neighborhood where the kids were riding bikes,” said Antoine’s grandmother. Antoine was on his scooter when he was hit. He was knocked unconscious and hurt badly as neighbors rushed to his aid. “He was literally under the car stuck,” explained neighbor Urusla Arocha. According to police, the crowd became angered after seeing the boy run down by a police cruiser, so they allegedly began throwing punches at the officer. “A parent who sees their child in distress, they are going to move into attack mode. 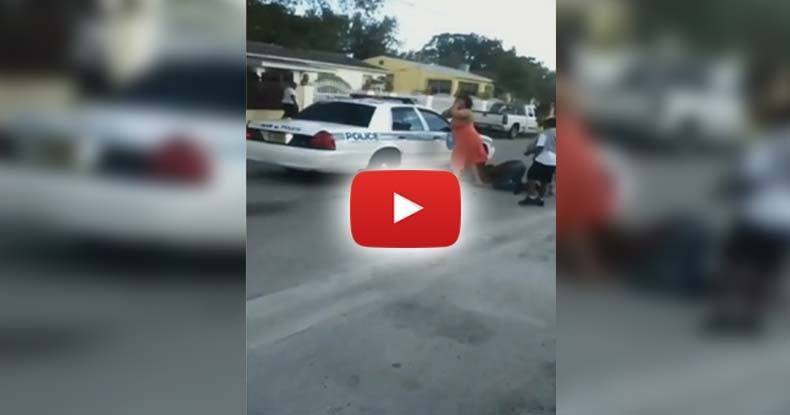 So they did throw a few punches at the police officer,” said City of Miami Police Major Delrish Moss. However, the cellphone footage does not show this, nor was it reported that any arrests were made. Also, witness Lexie Montanier said that was not the case. Police are claiming that Antoine darted into the street from behind two trucks and by the time the officer saw him it was too late. Antoine’s family said he suffered a broken hip, broken leg, internal injuries. As the Free Thought Project reported last year, a shocking report out of USA Today, exposed just how dangerous being an innocent bystander can be when there is a police cruiser driving by. On average, according to the report, one person every day is killed during a high-speed chase. To put this into perspective, that’s larger than the number of people killed by floods, tornadoes, lightning and hurricanes — combined. Contrary to popular thinking, high-speed chases aren’t only dangerous for those involved. Innocent bystanders are all too often the victims of these reckless pursuits. According to the report, more than 5,000 bystanders and passengers have been killed in police car chases since 1979. Tens of thousands more were injured as officers repeatedly pursued drivers at high speeds and in hazardous conditions.